Rosângela was Nego’s aunt, and it turned out he and I knew all the same people, so I went home at 3 in the morning to collect my things and meet him back at the Tamba-Tajá. I brought my toothbrush, a blank notebook and a couple changes of clothes to last me through Tuesday. 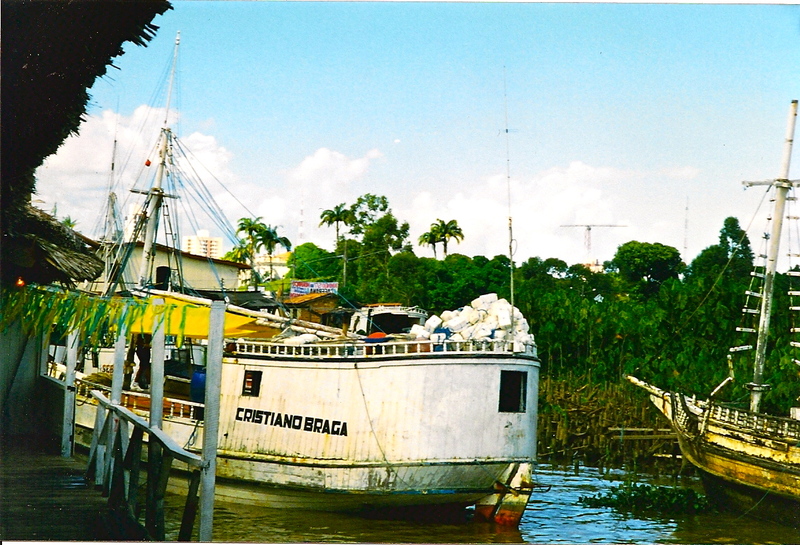 Back at his parents’ house, Nego and I got a couple hours’ semi-drunken sleep before we set off for the docks in Cidade Velha, Belém’s old quarter, from which you can get local boats for just about anywhere in the Amazon. Everyone laughed at Nego and me in our hangovers. Aluízio, the patriarch, had seen this before. Nego’s twin brother ribbed us through our headaches. Nego’s mom just shook her head, while his sister chased after her 4 year old son, Hugo – her yelps of “ooooo-go!” “ooooo-go!” (in Portuguese the “H” in Hugo is silent) echoing throughout the trip as she tracked after the boy to keep him from falling off the boat, pull him away from knives, or just quiet him for a few minutes so we could rest our ears. Oscar, Hugo’s dad, hung with Aluízio and Nego’s mom, who made sure I was comfortable and happy as we set off. 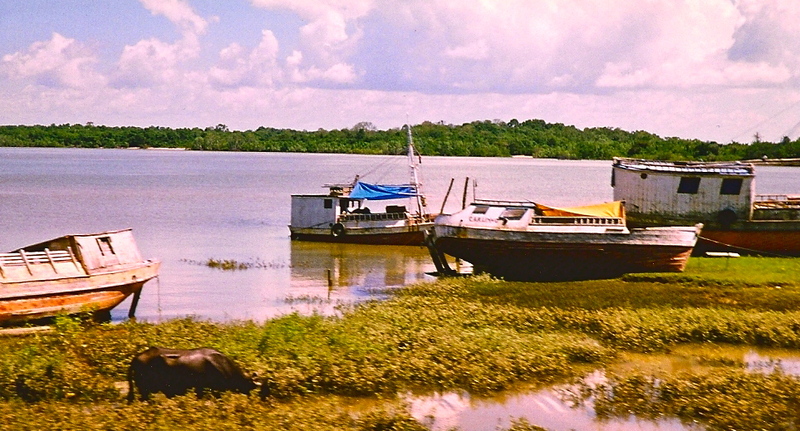 This was my first boat trip in Amazonia, crossing the Baía de Guajurá to the bus stop at Barcarena. As the boat backed away from the dock, we watched the city recede into a collection of smaller houses and palm trees, behind which rose a massive skyline of highrise apartment buildings. A lot of women from Jurunas live in those highrise apartments, in the maid’s quarters, next to ironing boards and sewing machines, just off the kitchen. It took an hour to cross the bay, where we waited for the bus in a parking lot. Used to be you went everywhere by boat, Nego told me, and then it took a full 24 hours to get to their little farm in Moju. With the roads and busses the trip shrunk to about 5 hours, quite an advance from the past. The bus ride itself was broken into a couple of parts, because you had to cross the Moju River and then change busses in the town. At the river, everyone got out the bus and ran down to water, where dozens of men and boys waited to ferry people across in small, open, wooden boats, a few cruzeiros for each person. About 20 minutes later, we were on the other side, in Moju town. Moju was a typical Amazon river-town – a collection of dusty buildings and streets, a trading post, some government buildings. In the center of town were the older houses, stuccoed and whitewashed, with Portuguese-blue lintels and trim. The further you went out from the center, the houses turned to wood and occasionally brick, getting smaller and more rustic. Nego had some relatives in Moju, one of whom was a political official of some sort. Nego’s own family was from Marajó, the large island in the mouth of the Amazon, to the northwest of Belém. There, Aluízio had been a mayor in some small town at one time or another. He was a staunch member of the “PMDB” – Party of the Brazilian Democratic Movement – which was the official opposition party during the military regime in the 1970s and 1980s. By the 1990s, the PMDB was the official party of the state governor, Jader Barbalho, who rode the opposition wave to wealth and finally condemnation as one of Brazil’s most corrupt politicians. Aluízio complained that all his children were “petistas” – for the party initials “PT,” the Partido dos Trabalhadores (Workers Party), which was the main left-wing party that had emerged in 79 as a more radical alternative to the Aluízio’s own PMDB. Nego laughs when Aluízio says these things. From Moju, we took the road again. It started out paved and but wound up in the same red clay as the streets of Jurunas. Thick rainforest alternated with cattle pastures. Charred stumps poked out the ground amid sparse tufts of long grass that would grow on the land for a couple of years, until the topsoil becomes barren and can support vegetation no more. 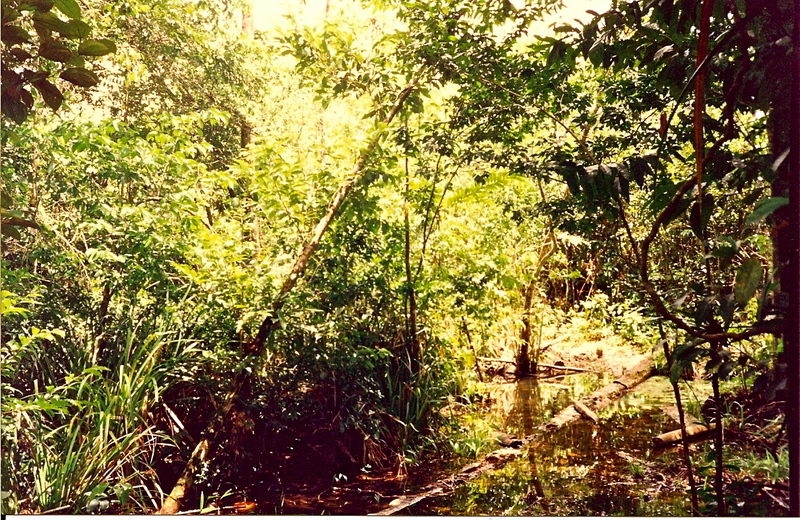 All the life in Amazonia is in the trees and bushes, and the soil they sit on is barren. Charred stumps and lumps of clay. Loam. Shrublike bushes. Not too many cows out there, but it sure was hot. So we barreled on down the road toward some place I’d never seen. By early afternoon we stopped and got off the bus in front of a small wooden shack by the side of the road. A smaller path left the roadside and disappeared into forest behind the house. A man greeted us and we went inside to eat, have a drink of water, and talk about the latest events in the area. This man was Nego’s uncle. He has a small farm next to the road and lived there with his daughter. Fruit was everywhere, hanging from the trees and on a plate before us. Mangos, caju, goiaba, pineapple, coconut. There were rice and beans, chicken. Good food and a lot of it, for we still had a few kilometers to walk through the forest. The photographs in this posting are all my own, taken on various trips to Belém and environs in the 1990s. Right now the rainforest and Amazonian issues are stirring up heat at the COP-15 summit, and as someone who has lived a significant portion of my adult life in Belém and has traveled all over Amazônia, I am hoping that some good things might come of this. The ties between deforestation and cows and greenhouse gasses are tight, though as Brazilian researcher and advocate João Meirelles Filho notes, cows are a bigger problem than Brazil or the Amazon. I don’t hold out that much hope from politicians, however, but I do find a lot to inspire in guys like Doug, whose Amazon Pilgrim blog recounts his journey across the Amazon, from Belém to Peru, by bicycle. You can find out more about Doug and his adventures at Green Upgrader, where he’s an editor. And of course, we can always find inspiration with one of the most popular foreign rock bands in Brasil, or anywhere else, for that matter, outside of their home Germany – and I am speaking of course of The Scorpions, whose concerts in Manaus have been sold out for the good of Greenpeace and the rainforest. For a different kind of concert in Manaus by foreign travelers, check out “Our Jungle Journey,” a blog by a North American couple who moved to Manaus to play in the symphony orchestra and other music groups there. They’re enjoying the splendid, world famous Manaus Opera House, one of the true gems of the Amazon’s belle epoque during the rubber boom (1880s through 1920s). One of the most interesting groups working in Amazonia on building sustainable lifestyles for the forest and the people who live there is IMAZON, Instituto do Homem e Meio-Ambiente da Amazônia (Institute for Man and the Environment in Amazonia), which was founded in the 1980s by a team of Brazilian and North American researchers. I’ve visited there several times in the 1990s and 2000, and they do great work. I love the little detail about running down to the water to be ferried across in small boats. Your adventure sounds absolutely heavenly, surrounded by such good people and experiencing the area like a native. This would make a great film. You write so visually I actually felt as if I was there. It must break your heart to a certain extent to witness what is going on in the Amazon these days. I pray we come to our senses before it’s too late. Selma – Thank you – I have to say that this comment makes me feel really proud. I work hard at the visual and other sensual aspects of experience. It’s funny yuou should mention film, for I have been experimenting with screen writing and really like the kind of wrap-around sensuality of film as a storytelling medium. More to come … again thanks for your thoughtful reading and comments.